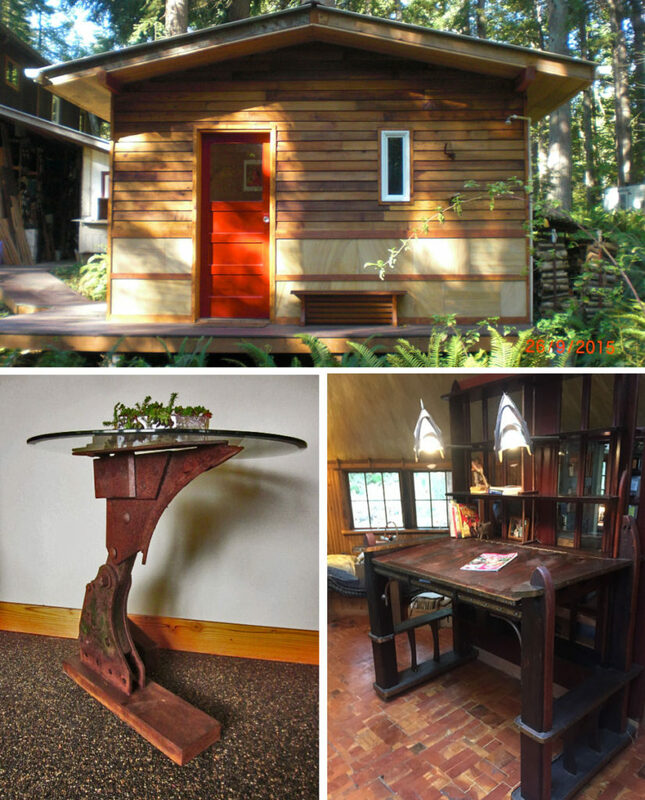 Construction & Remodeling Category Winner: Julie Clinton & Clint Boushey for their sauna/guest house building where just about every material was salvaged or repurposed materials – from framing, windows and siding to all the the interior details (top pic). Art & Furniture Category Winner: Wayne Chaudiere – who built his Good Tillage table from discarded plow parts and salvaged glass (bottom left). Runner up: John Harris and his desk made from a salvaged office door and transom window along with old framing and trim (bottom right). These three will be entered into the national contest – winners will be announced no later than January 15th, 2016. Stay tuned — and good luck to our local winners! Update (January, 2016) – Congratulations to John Harris who won FIRST PLACE in the Art & Furniture category with his desk project. And to Wayne Chaudiere for THIRD PLACE in the same category. Way to go Bellingham entrants for a great showing in this national contest!